President Zuma’s seemingly off the cuff proposal to shut down the parliament in Cape Town and put it somewhere in the veld in Mid Rand prompts J. Brooks Spector to look at the uses of moving a capital. By J. BROOKS SPECTOR. Some years ago, this writer was working Lagos, Nigeria and was staying in a small hotel informally known as ‘the Italian place’. The accommodation was pleasant enough. Hanging on a wall was a map that showed detailed construction plans for Nigeria’s new capital of Abuja. It took a while before the penny dropped. The point was that when a nation embarks on a massive construction project like a new capital, there is a virtual cornucopia of contracts that spills outward from such an effort. Architects, engineering firms and construction firms get big deals while hundreds of additional subcontractors come in under the big firms. But that’s not the sum total of it. All the people involved in this mega-construction project need places to do their work, transportation to and from their original homes and to the building sites. There have to be restaurants and hotels for them to stay in while they are working on the various stages of the gigantic process. Ultimately, all of this means money. Lots and lots of it. And just like the old saying that Rome wasn’t built in a day, no new capital is either. And every construction project since Rome has undoubtedly come in over budget. And so it turned out that “the Italian place’ in Lagos had been a home-away-from-home for Italian architects and construction managers who had worked on key parts of the construction of Abuja. The hotel was still run by the Italian family that had come to Lagos years ago at the behest of the Italians involved in building projects in Abuja, and they, in turn, had contracted with a team of Cuban hotel staff to supervise day to day operations while a team of Nigerians, Ghanaians and other West Africans did all the heavy lifting. The place even featured a small pizzeria and a restaurant with food selections that had passed through a variety of some very eclectic cultural and culinary influences. But those in the know stayed there rather than one of the big international hotels. Memories of that Italian guesthouse came flooding back to mind when South African President Jacob Zuma made a totally unexpected proposal to move the country’s national parliament to Pretoria from its long-time home in Cape Town. Where did the idea for such a proposal come from, and what was its purpose? In his 2016 State of the Nation speech, Zuma asked the nation’s parliament to consider consolidating the national government’s functions in Pretoria, instead of Cape Town, because the bureaucratic apparatus of the state is primarily located there. The reason was set out as a cost-saving measure, in response to the growing rumbles about the Zuma administration’s apparent proclivity for extravagant spending, wasteful expenditures and outright graft. Not terribly surprisingly, throughout his administration, Jacob Zuma has taken a fair amount of heat over his inflated cabinet and those officials’ spendthrift ways. As a result, it is difficult to avoid wondering if this possible shift of the legislative functions from Cape Town to Pretoria is a way of trying to shift the debate – and the heat – away from the costs of all those delegations with multiple cabinet members and their staffs, families and hangers-on to all those UN conferences? Or, more darkly still, given the antipathy between Zuma and his opposition, was this a way of taking a politically adroit swipe at the city of Cape Town and the province of the Western Cape – both governed by the national opposition party, the Democratic Alliance – to make government spending there shrink? So just how does a nation decide to pull up its tent stakes and move its entire capital from where it was and start from scratch somewhere else? Consider the cases of nations like Brazil, Nigeria, Germany, the US, Japan, China and the Ivory Coast. Since the early part of the 19th century, the Brazilian constitution has contained a clause specifying the necessity to move the country’s capital far inland and away from the crowded metropolis of Rio de Janeiro on the coast. By the end of the 19th century, the country had actually made a stab at moving some of the centre of gravity of development inland in that seemingly vast, empty empire. At first, the city of Belo Horizonte was established, and then, in 1956, architects Oscar Niemeyer and Lucio Costa began to make the move of the capital a reality. In a similar way, Canberra, the federal capital of Australia, located in the interior to the west of Sydney in order to encourage settlement in the interior, was established in 1913 as an embodiment of both the garden city movement and the political unification of the heretofore separate dominions on the vast island continent. Or consider Nigeria. Post-independence, in the wake of internal conflicts such as Biafra’s attempted secession and continuing strife between the largely Christian south and Muslim north, the Nigerian government decided to build an entirely new capital – Abuja – roughly at the centre of the nation, completing the initial development of that city in 1991. Further south, Malawian President Banda decided to move that country’s capital to Lilongwe from the old colonial headquarters and commercial capital of Blantyre in 1975. There, the last government offices were relocated in the new capital by 2001. In the Ivory Coast, Yamoussoukro became the official capital, largely as a reflection of the personal whim of the country’s long-time president, Félix Houphouet-Boigny. Immediately after America gained its independence from Great Britain, the new country’s precarious finances meant that the Continental Congress (the government under the Articles of Confederation) was forced to move from city to city. They often arrived just one town ahead of the mob of angry ex-soldiers who were insistent on being paid a promised (but long-delayed bonus) for their service in winning the country’s freedom. As for Germany, throughout the country’s history, right until 1871, nobody saw Berlin as the logical capital of that nation. In fact, there was no nation. Previously, when it was a loose collection of largely independent states, the elected emperor of the Holy Roman Empire often moved from place to place for his court until he elected to move on. Once the title of emperor became hereditary with the Habsburgs, the imperial capital became coterminous with that of the ruling family’s domains, at Vienna. When the revolution of 1848 broke out, the revolutionary assembly met in Frankfurt, and it was only when a united Germany was declared after the Franco-Prussian War under Prussian leadership that Berlin became the new nation’s capital. Post-World War II, with a defeated Germany split into two halves, the sleepy town of Bonn on the Rhine River became the capital of West Germany while the nomenklatura of East Germany took up their control in the eastern half of a still-largely ruined Berlin. But, once the two parts of the nation were reunited after the collapse of the Soviet empire, the new, all-German parliament debated about whether it should keep the capital in Bonn or move back to Berlin, even though the city had all those imperial, Nazi and communist ghosts lurking about. But Berlin won out, not least for its size in comparison to that small city whose most important citizen had always been the composer Beethoven, rather than any politicians, although Konrad Adenauer had come from nearby Cologne and professed to love Bonn. In East Asia, China’s capital routinely shifted with the changes in imperial dynasties throughout the country’s long history. Even in the 20th century, the Nationalist capital had been shifted from Beijing to Nanjing (or, from the Northern Capital to the Southern Capital) as a clear break with the past. Then, during the war years, they were forced to move to Chungking, when the Japanese army conquered the area around Nanking. The communists, upon their victory in the Chinese Civil War, returned the capital to Beijing – although when the Nationalists retreated to the island of Taiwan, and they established their new capital in the city of Taipei, they dubbed it their temporary capital, pending a return to the mainland and their real capital of Nanking. As for the Japanese, historically, they have moved from their first capital at the central Japanese town of Nara (built like a small version of the Chinese model of a capital city), then to Kyoto, Tokyo, Kamakura (remarkable for that massive bronze statue of the Buddha that still stands) and back to Tokyo. Curiously, for much of the time, Tokyo was not officially the capital, but only the city housing the shogun, the emperor’s designated ruler, while the emperor himself continued to reside in Kyoto until 1868, when the now-hereditary office of the shogunate was done away with finally. Prior to the end of apartheid, the prime minister, his cabinet and senior permanent officials would decamp every year for Cape Town when the parliament was in session, with the top dogs ceremonially using the Blue Train for the transfer, and official files and working documents were shuttled to the temporary Cape Town offices the officials would use during the parliamentary season. The reverse would then take place once parliament adjourned each year. There are, obviously, some common threads in all of these examples, and others. The first of these has been the desire by a ruler (or a new dynasty) to put their personal stamp on things. Out with the old, in with the new. Second is the need for a political compromise between potentially warring factions in a divided nation. A third is the desire by a ruler to engage in some vast public works projects (and the spreading of some serious money around to curry favour with potential malcontents and, no doubt, favoured contractors). And finally, there is the use of a new capital as political statement in the political aggrandizement of the leader and the humbling of his opponents. Although the supposed rationale for President Zuma’s proposal was made for cost-savings reasons, his critics have already leapt on his idea, arguing, instead, that cost savings could more easily be realized from some pruning of the current cabinet, from cutting back on the extravagances of office or from the paring down of wasteful spending more generally. Meanwhile, left unstated in the president’s proposal is any kind of attention to the cost of building an entirely new legislative chamber, a new parliamentary village and all of the associated facilities that go with those two as well as the relocation costs for all the staff members who are fulltime officers in the parliament. Left out of the president’s proposal, too, is any kind of cost-benefit analysis of the impact on Cape Town versus any potential long-term savings for the national budget. As a result, is it too hard to believe that the proposal itself was at least partially meant as deflection away from all those other areas of criticism and as an effort to sweep everyone into an entirely new debate, just as criticism of the president over other his faux pas reaches towards a crescendo? Or, more simply put, is it just a classic bait and switch exercise? It is a shame that this is how any discussion over a potential government redesign will take shape, rather than more genuinely innovative ideas. It is a shame because this is where the president could well have, instead, provoked a serious exploration about making vigorous use of 21st century technology. Why must a regiment of officials troop back and forth to Cape Town from Pretoria each time someone has to give testimony on something? Surely this would have been the moment to introduce planning for high-quality video conferencing between the two cities for all those hearings and meetings, something already routine for so many businesses worldwide. This could also have been a defining moment to explore so many other cost-saving ideas to streamline and modernize South Africa’s government. But it wasn’t. Of course, there is always the chance that the proposal will die a quiet death, even if the Speaker of the House, Baleka Mbete, has already indicated the proposal will get some quick attention in her parliament. 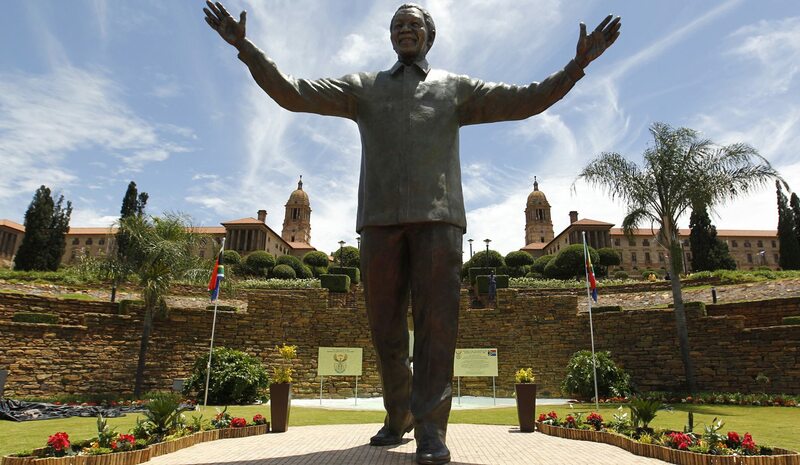 Photo: A 9-metre (30-feet) bronze statue of the late former South African President Nelson Mandela is unveiled as part of the Day of Reconciliation Celebrations at the Union Buildings in Pretoria December 16, 2013. REUTERS/Thomas Mukoya.